Had to share who came up to the family at the beach. 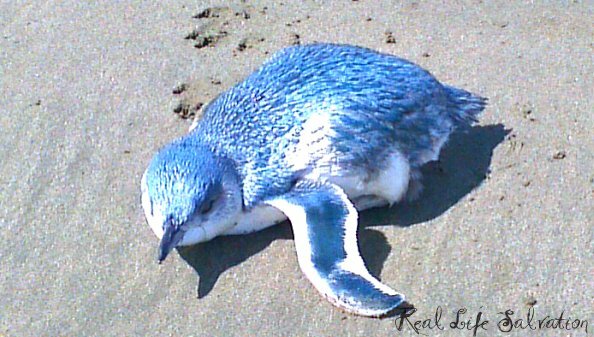 This is a blue penguin native to New Zealand and also the world's smallest. He came right out of the ocean and followed us very closely, without fear, until the children lead him to the sand dune. I say lead but they honestly were following him/her giggling and jumping with glee when he appeared and in a fashion that is quite common to blue penguins, found his way to the sand dunes to chill out. Do you know how difficult it was to keep three children away from his cuteness? Incredibly. So we allowed temporary visitation of our blue friend about every 10-15 minutes. They also named him "Bluey" and said a prayer for him at bedtime that he survived. In an early evening phone call from Enviornment Reporter Rachel Young from The Press, we were informed that they are usually only active at night and his daytime appearance, according to her sources, was a bit strange though Bluey should be fine. In effort to find out more information and perhaps alert Game & Wildlife, we'd contacted the paper via email with an attached photo of the picture but didn't get the return email until late so we missed that days' press run. That is what we get for hanging out at the beach all day with a bad connection. Newsworthy or not, this experience was one for the family books (or blogs) and he drew quite a crowd that day. We are still amazed when we look at this photo. We were so in touch with nature and, unfortunately, this probably won't ever happen to us again. This animal is pretty well protected but this close of an encounter is not common. So we are very thankful for this very real life experience. Shop for the sea animal books & toys today!